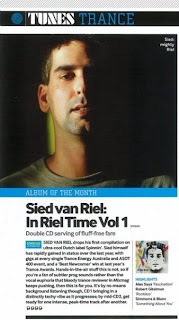 As you know Fascination was featured on Sied Van Riel's mix compilation "In Riel Time". The album got reviewed in the biggest DJ magazine, DJ MAG. "In Riel Time" became the album of the month and Fascination is one of 3 highlights. The tracks seem to live their own life. It's not like beeing a major artist like David Guetta when all the focus is on one track all around the world. Here is the review scanned from the magazine. Click on the pic to see it bigger.